Writing about the spirit of an herb and channeling its deva is one of my gifts and a passion. When asked why I write about specific herbs my reply is, I don’t pick the herbs, the herbs pick me. And while this statement might be the most accurate it is not the whole truth. I do physically pick up an herb, but not in the rational way that we have been taught to think about these things like – oh, I need this herb because of xyz so I’ll go to the store and buy it, or get online and order it. Rather, I journey with the herbs by calling them in both physically and energetically. I have developed an intuitive knowing about plants and a kinesthetic alignment. It’s akin to a navigation system where both the plant and I are traveling at a certain frequency, and as long as I remain open and receptive, that plant will find its way to me and I to it. This is a story of how one particular herb, Pelargonium sidoides, came to reveal itself, helped me to heal from an upper respiratory infection, and how it might help you too. Late this past summer I had the good fortune of attending the Traditions in Western Herbalism conference where I also had a vendor’s booth. The conference took place at Ghost Ranch in Abiquiu, NM, in the magical red rock canyon lands of the Desert Southwest. We were herbalists on a mission. Herbalists that defy all attempts to be put in any kind of a box: Hippies, Freaks, Naturalists, Scientists, Grandmothers, Young Parents, Business Owners, Researches, Doctors, Nurses, Rebels, Free Spirits, Alternative Health Practitioners, or the plethora of self given and unregulated titles such as Clinical-Medical-Master-Village Herbalists. And if the Gods be willing it will stay that way – unregulated. And yet somehow through all of those labels we have managed to defy space and time. That’s because we’ve always been here. And will continue to be here for as long as there is life on this beautiful blue-green planet. Coincidentally, my vendor’s booth sat directly across from Herb Pharm’s booth, a manufacturer of liquid herbal extracts and herbal healthcare products. They have been around for about thirty years and are based in Williams, Oregon. Well it just so happens that they were giving away one-ounce bottles of their liquid herbal extracts. Score. Herbalists are a generous bunch of folks. And for those of you who have never attended an herbal conference it is a great place to experience the wisdom and generosity of herbalists and herbal manufacturers, test different products and receive a plethora of samples. So while looking over the tinctures: Echinacea, immune tonics, lymphatic tonics, and the names of various familiar herbs, I discovered one that I had never heard of before, Umckaloabo. What a strange name, I thought and the description read, “Supports Healthy Sinus, Nasal & Bronchial Function.” Well, I had been sporting a chronic sinus infection for a number of years now that nothing seemed to cure (although New Mexico’s high desert air was certainly helping,) so I picked that one up, put in my bag and promptly forgot about it. A month later while promoting my new book at the Miami Book Fair International I met a young black woman who was interested in my book. She told me in hushed tones that her grandmother was an herbalist in Jamaica and had been teaching her about some of the African medicinal plants, but that her mother (who stood some distance behind her) was a religious woman and couldn’t relate to plant “spirits.” She wanted to know if I had ever heard of a particular African herb, Moringa. I hadn’t. But somewhere in the back of my mind there was another herb whose strange name was stirring. Meanwhile, my busy schedule of book tours, radio shows, interviews, conferences and teaching gigs continued until the exact moment of Winter solstice when I came down with a bad cold. The infection quickly moved into my lungs and I raged with a fever. Having had asthma as a child my lungs tend to be susceptible to infection and eventually colds started turning into bronchitis, and then on a few occasions, pneumonia, until I learned how to take better care of myself. Now in my late fifties I rarely get a cold, but when I do it almost always lodges in my chest with an energy depleting fever. It seems that no matter how many herbs I have tried, and the list goes something like this; Echinacea, Goldenseal, Ginger, Garlic, Red Root, Yerba Mansa, Osha, Elecampane, Grindelia wild harvested from my beloved New Mexico, and a variety of Chinese herbs that clear heat, in the end I resort to antibiotics: A very frustrating proposition for an herbalist. In addition, a number of years prior to this, I had been exposed to mold in a home where I was living, which reactivated my asthma and started a sinus infection that I had been unable to get rid of even after thousands of dollars of acupuncture and medical treatment, and of course a plethora of herbs, until now. This recent illness had me scared. It was only a few days before the Christmas holiday and having recently moved to a new town, I had no doctor to call. So, I immediately launched in with the herbal teas, starting with a diaphoretic and a hot bath, hoping to sweat in out. Then I climbed into bed with a good book, one that I had wanted to read for over twenty years, I Know Why the Caged Bird Sings, by Maya Angelou. When I lived in Berkeley, California, a voice teacher in Oakland had given it to me. I wondered what had taken me so long to finally read this book. On day two of the cold, which my husband thought was the flu I was so sick, and as I read about African American life as only Maya can write about it, I remembered the tincture bottle I had picked up at the conference. I began taking the Umckaloabo extract as directed and in between fits of a fever, an excruciating sore throat and profuse mucus discharges; I got online and looked it up. The research was extensive. This was an herb that has long been used to treat congestion and respiratory infections. It has been shown to safely and effectively treat acute upper respiratory tract infections such as bronchitis, tonsillitis, sinusitis, pneumonia, and the common cold in adults and children as young as 1-year. It is also useful for chronic ear, nose and throat infections. It works in three ways: 1) Stimulates the body’s immune system is such a way that bacteria and viruses are prevented from multiplying. 2) Acts as an expectorant, expelling contaminated mucous making conditions less favorable for the multiplication of virus and bacteria. 3) Supports a quick recovery phase by preventing bacteria and viruses from attaching to cells in the mucous membranes. This prevents re-infection and helps to break the cycle of infection. One can see a rapid reduction of symptoms associated with colds and flu when using this herb and it has been shown to decrease the duration and severity of acute upper respiratory tract infections. Pharmacological studies suggest that its actions are many including mucolytic, antiviral, antimicrobial and an immune stimulant. P. sidoides has proved to be a good alternative to the conventional therapy of treating respiratory illnesses with antibiotics. 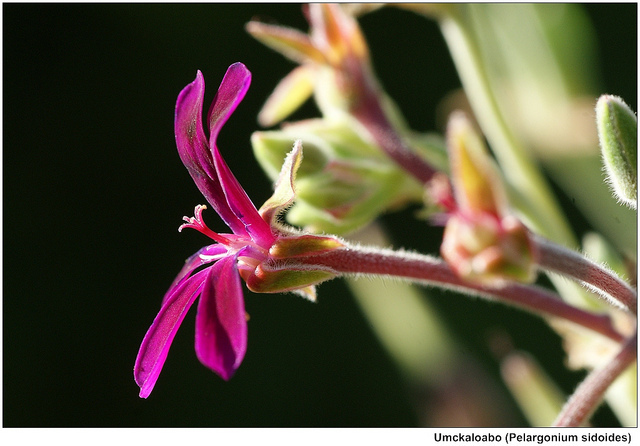 Umckaloabo, if you haven’t guessed by now is an African herb and a member of the Geranium family that lives in the coastal regions of South Africa. The name is derived from the Zulu tribal language and means, “heavy cough.” It is described among the Zulu as an herb that relieves chest pain with infection. The genus name Pelargonium is derived from the Greek word Pelagros, which means stork. It refers to the seedpod that resembles the bill of a stork. A medicinal extract is made from roots that are approximately 3 years old and Herb Pharm uses roots that are organically and sustainably grown, hand harvested, and carefully shade-dried. Umckaloabo has beautiful deep-red flowers and large heart shaped leaves. I was falling in love with this plant. Love is the cohering force. It’s what brings us together with exactly what we need in any given moment. This is what Umckaloabo and so many other plants have to teach us. That we always have everything we need. By the grace of the Umckaloabo deva, who is an intelligent being already in light body, I received a healing from this plant of both an acute upper respiratory infection and a long running sinus infection. Light contains information and that is what lives inside each and every atom of which we are made. This is where we meet the plant devas – inside of ourselves when we call upon them, and are quiet enough to hear and receptive enough to receive the information and guidance they have for us. If I told you that I know of herbs that could keep your child from needing to have tubes put in their ears or their tonsils taken out, or could keep you from needing to take antibiotics, would you believe me? Would you take them? You can know these things first hand, too. You have only to look inside of yourself and trust that you are living in a nurturing and supportive universe. If you are willing to commit to working with a plant medicine and are consistent you will be richly rewarded. You will learn how to believe in yourself and deepen the relationship you have with your body. You will discover that you are a healer in relationship with others who are their own healer. This is the inspiration that I wish to share with you. It comes from the wisdom of the plant devas, and is an herbal medicine for the New Earth. The recommended dose is 1.5 ml, 3-4 x a day for seven days for upper respiratory tract infections, and 3 ml, 3-4 x a day for 21 days for acute sinusitis. Side effects are rare and have consisted of mild gastrointestinal upset or skin rash. It has been sold extensively in Germany. Pediatric safety has been demonstrated in large post-marketing surveillance studies. Pelargonium sidoides Extract: Alternative Treatment of Acute Upper Respiratory Tract Infections, Botanical Profile by Donald Brown, ND, Natural Medicine Journal, 2009. Matthys H, Kamin W, Funk P, Heger M. Pelargonium sidoides preparation (EPs 7630) in the treatment of acute bronchitis in adults and children. Phyto­medicine. 2007;14:69-73. Thea, thank you for this timely article! Very helpful information (and a lovely plant). Wondering if this root is tinctured in the same way as others (like Echinacea). I’ve obtained the root and would like to make my own tincture using alcohol or veg glycerin. sorry…should have added can it be used as a tisane as well since we’re all suffering with seasonal colds.